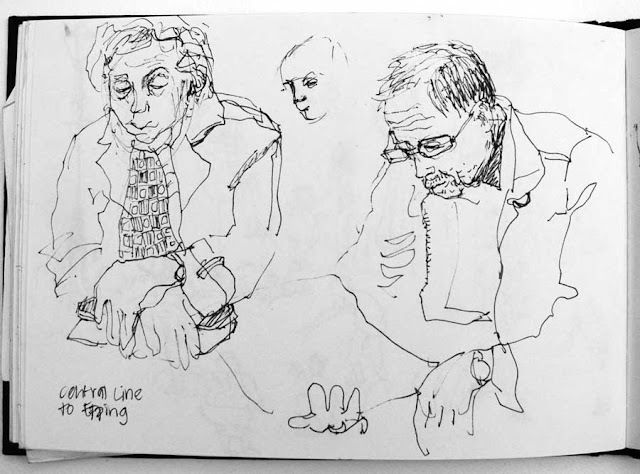 Curiously, older people are harder to draw unobserved. Perhaps they aren't so used to the invasions of privacy a younger generation regards as unremarkable - the constant photographing, blogging and sharing images of ourselves on facebook. I try to be discreet when drawing on the train, and hope that at the very least I'm celebrating people's individuality in a sensitive, if not always conventionally flattering way. hmm. I like very much.